It has been a while since my last post. I have been going through a rough time lately and I haven’t been able to write at all. My depression tend to worsen during the winter months and this year is no exception. I guess it is because of the lack of sunlight. The constant darkness makes me feel isolated and claustrophobic. I’m definitely longing for spring time so I decided to write about an image I created last spring. The image is called «Free Fall». People suffering from depression often feel that the rest of the world is spinning around them while they are stuck in the mud and unable to participate. The waterfall is symbolizing the moving world around me while I’m stuck in a stagnant position. 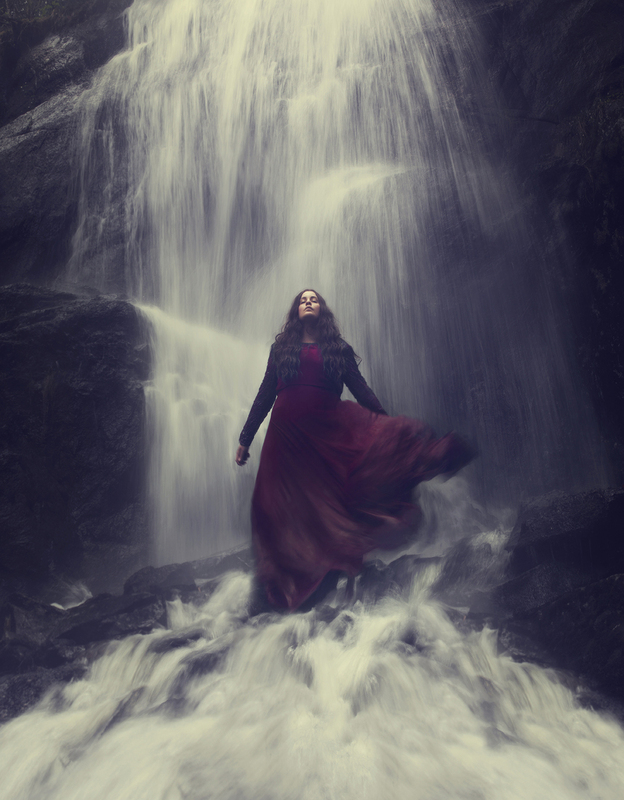 I‘ve been wanting to shoot in a waterfall for so long so when I found this place deep in the woods a couple of years ago I was thrilled. A few days later I packed my gear and rode my bike deeper and deeper into the woods. It was a huge disappointment when I realized that the waterfall had dried up. I did take some pictures but none of them turned out any good. I gave up on the whole idea until May last year. It had been raining for days and all the rivers in the woods were flooding. I started thinking of the dried out waterfall. Maybe it is flooding with water as well? Again I drove my bike deep into the woods. As I was approaching the waterfall I could hear a thundering sound. The waterfall was on it’s full capacity! I set up my gear and hopped in the water. It was cold as hell! I wore my rubber boots for the occasion, and they filled up with water in a matter of seconds. When I’m doing self-portraits I have to run back and forth to the camera to check the images in order to make the needed adjustments. This time however I had to climb rocks and balance my way down to the camera. I managed to trip over several times so it was hard work. When I finally got the shot I had to rode my bike home while soaking wet. My rubber boots was making gurgling sounds all the way home. I decided to take advantage of the running water by working with long exposure. This makes the water looks like a veil that’s surrounding me and it gives the image a dreamy and ethereal look. In post production I added more contrast and adjusted the color. I wanted to add some warm tones to the image but it only made the water look yellow and muddy so it was quite a challenge to get it right. After to years of planning my waterfall image it was finally a wrap. I did a black and white version of the image as well, but I think it works best in color.